The interview series poses questions concerning the role of affects and emotions in research practice and contemporary society to researches on short-term visit and associate members of the Collaborative Research Center „Affective Societies“. 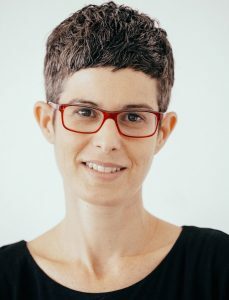 Today, we introduce Michal Givoni who teaches in the Department of Politics and Government at Ben Gurion University, Israel. She works in the field of contemporary political theory and studies the intersections of non-governmental politics and moral sensibility. Her book, The Care of the Witness: A Contemporary History of Testimony in Crises was published by Cambridge University Press in 2016. During her stay at the Collaborative Research Center she will give a public evening lecture entitled „The Politics of Empathy: Humanitarian Assistance of Palestinians from Israel in Greece“. The lecture will take place on November 22, 2018, 6.00 pm. For further information, visit the CRC Website. I’m interested in how people live through an ordinary crisis that is not always experienced as such, and in how they manage the feeling that the future doesn’t hold much in store and can only surprise us in a negative way. The answer seems to be obvious, and maybe too obvious – when people don’t have much to look forward to as individuals and as members of political collectivities they retreat to the personal, the intimate, and the banal – or worse, fall prey to populist, racist, and fundamentalist ideologies. I believe that there is much more going on in these states of impasse, and particularly, that efforts to survive politics do not always clash with the need to help politics survive. I’m drawn to what one can call, following Sianne Ngai, ugly political feelings – despair, renunciation, apathy, fatigue, indifference and their like, and I wonder if they are as poisonous and unidimensional as we think they are. As someone who was born and raised in Israel and has been living through the protracted occupation with its cycles of political violence and its suffocating loss of hope, I would very much like to think that something may come out of the public feelings we have, and not only of those feelings that appear to serve us better but that we struggle so hard to adopt. I’m not sure if it can be qualified as an emotion, but I’m continually surprised by the relevance of hope, or rather, by the ways in which hope is sustained as a publicly relevant feeling. At least in Israel, and particularly among the Zionist left-center, the preoccupation with hope, its cultivation, and its maintenance has been on the rise in recent years, at exactly the same time when the conflict with the Palestinians seems to have reached a deadly impasse. It is in hopeless situations that it is seemingly most urgent to keep the flame of hope alive, but I think that it is also in those situations that the disparate political implications of various notions and modalities of hope become most pronounced. In Israel, we seem to be witnessing the rise of a new imperative of hope that is entwined with political technologies for instilling hope that assumes – and even provide scientific evidence for the fact – that hope can only be maintained if people can envision a future solution that will put an end to the current political problems. I wonder what kinds of hope are being marginalized – or are not being considered as relevant enough – when hope is so forcefully presented as a derivative of a political plan that more often than not takes the form of the two-state solution. I feel that some of the efforts to maintain the relevance of hope in Israel today are actually an attempt to convince us that we shouldn’t be hoping for too much. I can think of many but I’ll focus on one, empathy, which has been both an affective driving force and an affective barrier in my recent research on the humanitarian activities of Palestinians from Israel in the so-called “refugee crisis” in Europe. This was my first experience in doing qualitative interviews, and the first time I became so intimately exposed to personal stories of Palestinians from Israel and their inspiring interplay of vulnerability and fortitude. I started this research out of empathy with the Palestinians and, of course, the refugees, but as the research progressed – and in a way that I had not foreseen – I became much more emotionally involved. I cannot say if this emotional engagement was more of a driving force or a barrier, but it surely played a part in turning empathy into the key concept that preoccupies me in this work. For those who read my answer to question no. 1, the answer to this question should be obvious – Lauren Berlant’s Cruel Optimism. As a newcomer to the field of public feelings and political affects, I came to this book belatedly. Its timeliness and explanatory power have not ceased to impress me since. For anyone looking for a great theoretical work that can lead us through the labyrinth of the historical present, this would be my first recommendation. Boredom, I guess. As long as there is something that attracts my attention, thrills me, and triggers me to think, I can handle whatever unpleasant feelings I have.